Whether you’re renting the space your business inhabits or you bought the space outright, one of the first things you should do, even before moving in (if possible), is to have all the locks re-keyed. Of course, if you’re renting the space, you’ll need to check with the property management company, but re-keying is an excellent way to easily improve security. Re-keying is the process of replacing lock tumblers, generally without replacing the hardware itself. What this means is any keys to the old locks will no longer grant access to your space. There is no way of knowing how many keys there were for your space, or how many copies were made without the management knowing, so re-keying is a great first step to cutting off break-in attempts. One of the big problems with securing a business is that you inevitably have to give access to other people. Copying a standard key takes a couple of minutes, at most, and is totally untraceable, so it can be hard to trust employees completely. In order to secure your more valuable assets, upgrading your locks beyond the standard can help prevent break-ins. A keyless entry system replaces deadbolt locks and can be installed on most exterior and inside doors easily. The benefit to keyless entry options is that you ditch the physical key entirely and exchange it for a keypad that you can program to whatever code you choose. Most modern keyless entry options even connect via the wi-fi, so you can connect remotely, reprogram new codes whenever you choose, and even get near-instant notifications when someone uses a code to unlock the door. This way, if an employee quits, you can change the code they used, so they can’t have access anymore. And, if anyone enters after hours, you can get a text or email telling you the door has been opened and which code was used. Because of these measures, keyless entry systems usually work as a deterrent for would-be thieves. For physical items you need to keep secure, your local locksmith can come install a safe for you. If you keep a certain amount of cash on the premises, odds are good you’ll be required by law (or by your insurance company) to have a secure way of ensuring thieves can’t just walk into your store and make off with all your cash. However, simply buying a safe isn’t usually enough; in order for most safes to be fully effective, they must be drilled in and physically attached to the walls so it can’t just be hoisted out of your building. In addition to safe installations, we can offer professional safe cracking. Sometimes, you may inherit a safe with a new business space, or the keys might go walkabout. If you have a safe you can’t open, allow the professionals to help you out. We will do our best to open the safe without damaging it, so you don’t lose that functionality, but sometimes drilling becomes necessary. However, we have the tools to repair most safes so they are still secure. 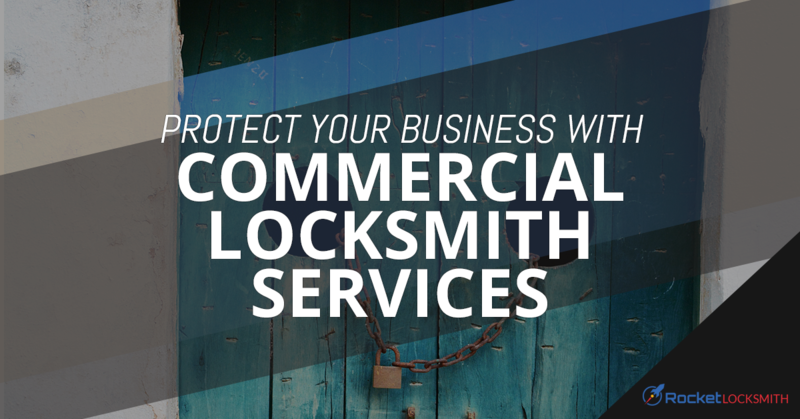 If you’re ready to improve the security of your business, searching “locksmith near me” can lead to a lot of results. Rocket Locksmith has the experience and knowledge to help and we’re locally based here in St. Louis! Contact us today for more!